Fellow wreath makers always ask me how to make a thin wreath to fit behind a storm door or screen door! My secret? Start with a premade evergreen wreath and add silk flowers to make an elegant Storm Door Christmas Wreath. This post contains some affiliate links for your convenience. Click here to read my full disclosure policy. 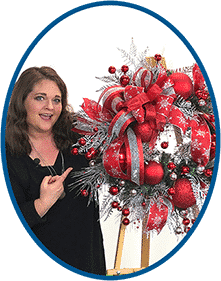 In this video, I share simple steps to create a Christmas wreath that can fit behind your screen or storm door. Easy to complete in about an hours time! I’m sure we’ve all seen the wreaths that are completely crammed behind the screen or glass like it was in a collision, right? Heck, no one wants that look! I mean, my in laws did it all the time and it drove me absolutely crazy! I wanted to fluff that poor wreath back to life every time I went through the threshold. Can you relate? Here’s how to make a beautiful wreath that will fit properly. Start with a thin wreath, no more than 3 inches deep. Fluff the wreath before you begin with your fingers. This makes it come to life. Add additional greenery to the wreath to make it wider (I added grasses and green eucalyptus). Remember the full depth of the wreath needs to be less than 4 inches, so add the greenery to the perimeter of the wreath. 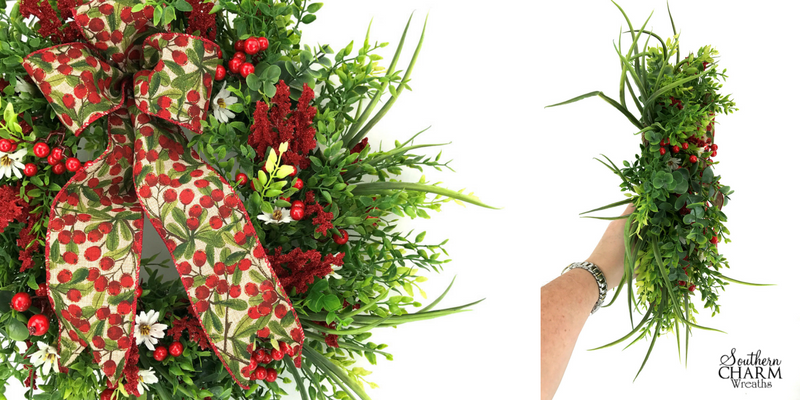 When adding greenery and other florals to your wreath, clip individual pieces/sprigs versus using an entire bush. For more tips to save money on silk flowers, visit my blog- 7 Great Tips to Save Money on Silk Flowers. Always place items in your wreath to test them out before gluing! Don’t be intimidated by bows…watch the video to see how to make a very simple flat bow for this wreath. Place your flowers so that they go in the same direction on the wreath – it is much more pleasing to the eye. Be sure to add flowers to the sides and not just on the top of the wreath – you want it to look good from all angles. Hot glue a leaf (or leaves) to the back side of the wreath to hide any mess from hot glue and wire, etc. Save your scraps! Save any leftover flowers or stems and use them for future projects. Nothing goes to waste. A wreath this size would make a great gift! Think about making one of these for friends, teachers, a nursing home door or to give as a hostess gift! As I mentioned in my video, one of the keys to wreath making is color. For help on choosing colors for your wreath, check out this blog post – Wreath Making – How to Choose Colors. 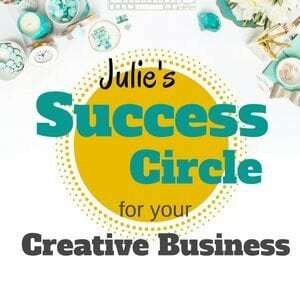 Also mentioned, my coaching and mentoring services for your creative business with my Success Circle Membership Group. Hi Julie, I love your videos and I love your personality!! Very helpful!!!! Put tiny white flower. Make them very airy. Again I love the video!! 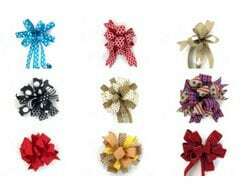 Very helpful I have otten seen smushed wreaths in between doors and that drives me crazy!!! This is the perfectly made wreath for Doors. I will attempt to make this one too. Love all the ideas & class you bring to all your videos! Hugs from- Pat from Ohio. Thanks for the kind words Patricia! Thank you very much for sharing your thin wreath. It will be such an added boost to our Holiday Decorations. 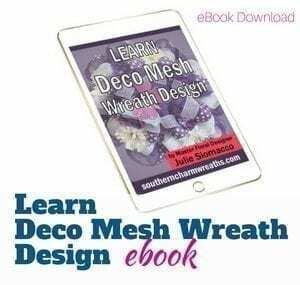 You are so great and always helpful sharing new ideas and explaining ways to make beautiful wreaths. Another fine video, Jules!! I’m on the lookout for a tea leaf wreath at Hobbs over here, not having much luck with it, though. May have to look for a second best one. Thanks for taking the time out of your day to show us how to make these beautiful wreaths!!! I wondered if there was a thin wreath for storm door. 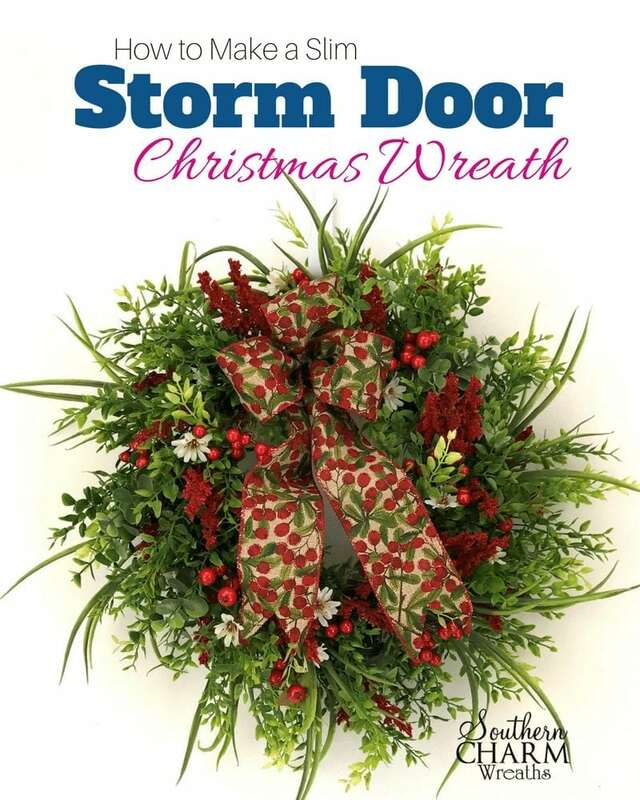 I have had several comments about people not able to have a wreath due to having storm door. So this was very interesting. Wondering if you could come up with an arrangement to go into a decorative cowboy boot. I live in Texas, so I don’t see anything along this line. Use any flower arrangement tutorial you like but instead make it in the boot. Fill the boot with styrofoam and have fun.